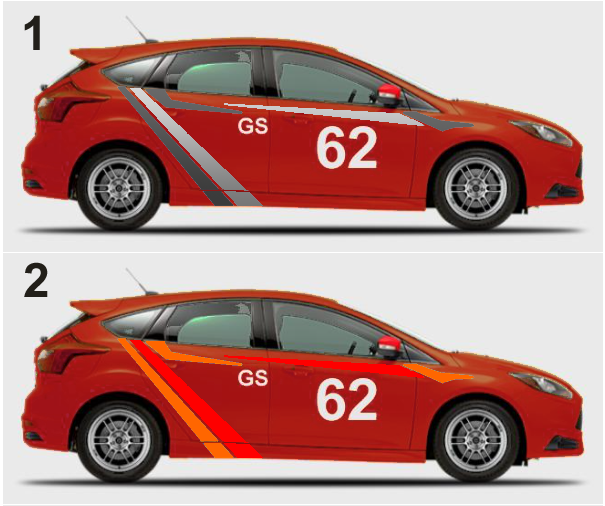 I'm considering adding some graphics to my autocross car, Pepper (Hot Pepper Red). With a lot of help, I've narrowed it down to the following two schemes. Which do you like best? Last edited by gemery; 04-09-2019 at 06:08 PM. I like one better as well. Not my car so can not decide for you. I like 1, but dont see on the picture if the graphics continue above the windows onto roof/spoiler? From beneath the rear window --> onto spoiler, from underneath mirror onto roof? Not my car so can not decide for you. Absolutely! Crowdsourced opinions will influence my decision, but there's always more to consider. I like 1, but dont see on the picture if the graphics continue above the windows onto roof/spoiler? They are just side graphics. In the long run, for big events, there are protected spaces for event sponsors and prize contingency sponsors, so it is important not to infringe those areas. Although the rear & roof are not reserved at this time, I might find a way to make use of them. I like the first one better. The grey adds some contrast to it. Flasher hardware differences and which tuners offer which?